Lots of material on diversity, in various forms, passes by my eyes. Articles about why women or people of color don’t really want to program, or aren’t really suited to it. “Well-reasoned” articles about meritocracy. All that stuff. Here are some thoughts. See also my article on hiring. In this article you’ll see some implicit and some explicit expression of my personal values about people, some thoughts about how people “are”, some thoughts about the system we live in, and whatever else comes to mind. First of all, people are people. I believe that all people have the same innate rights – life, liberty, pursuit of happiness and all that – and those rights include equitable access to education, health care, work, and, well, basically everything. Someone might disqualify themselves from deserving access to some things, perhaps by performing some nefarious action. I’m all for jailing people who commit major crimes, and all for keeping people who smoke out of the range of my lungs. You know, reasonable things. But by and large, I think that everyone in the world should have a fair shot at all good things. People’s abilities are all over the map. However you slice people, by gender, color, “race”, and so on, and whatever ability you’re wondering about, there will be overlapping distributions of that ability. And the overlap will be almost 100 percent. The means may be a bit different, the tails may be a bit different, but overall, women or people of color or whatever your division is are just about as good at whatever ability you’re talking about as the people in the other class. Individual differences make almost all the difference. Now I’m talking mostly about programming here, although what I’m saying surely applies to other STEM kinds of abilities. It’s possible that there could be some genetic birth-based difference in the mean between, say, men and women. Maybe on the average, women are better than men at ABC and men are better than some women at DEF. Even if that were true, there will be plenty of men who are better than some women at ABC, and plenty of women better than men at DEF. But what makes people good at ABC and DEF isn’t birth. It’s learning and practice. So genetic leanings, even if there are any, which is not obvious, don’t apply to Joe and Mary. Joe was born with a gift for Java, and studied history, while Mary was born with a gift for dance and studied Java. Sorry, but Mary can out-program Joe all day, because Joe has no clue at all about programming. Distributions tell us nothing about Joe and Mary. Individual differences make almost all the difference. The systems we live in, loosely called “society”, do make a difference, not in people’s abilities, but in what happens to them. I’m not justifying the system here, just observing. “Little girls” are commonly given dolls to play with, while “little boys” are given cars and trucks and erector sets. Not always, but commonly. Girls are often guided away from “dirty” activities like building, or techical activities like programming. Not always, but commonly. People of color encounter similar systematic pressures. People call the police on a black paper boy or lawn mower. A white kid is more likely to be hired into many jobs than a black or brown one. You couldn’t hire me to “drive while black”: it seems like a losing proposition to me. The systems we live in impact our choices, and limit our opportunities. We need to accept this: it’s a fact of nature. And after accepting it, we can work to change some aspects of those systems, and to adjust for undesirable effects. That’s what “diversity” efforts of all kind are about: changing the system and adjusting for its undesirable effects. Changing the system is very slow, and often does nothing for existing people. Even if we begin to do less “guiding” of girls in one direction and boys in another, existing men and women have already been guided, for better or worse. Even if we begin to raise people’s awareness of the rights of everyone to equity, that will take a long time. Sometimes we can adjust to the system faster than we can change it. A few wise managers and executives can adjust hiring policies to give women and minorities a better chance at getting through the barriers. One really great example of this is in the recent trend of hiring musicians in orchestras by having them play behind a curtain, so that their gender, race, or appearance can’t be part of the decision process. Maybe we could do similar things in programming. I was thinking the other day that it would be fun to set up a programming problem, and invite people to submit solutions. Deep in the system, we’d collect demographic information, but we would “judge” the solutions without regard to the name, gender, race, or any such characteristics of the person submitting. Then we’d look at the distributions of score vs various of those characteristics. I suspect the results might be astounding. I suspect we’d see no difference in some areas, and some inversions of standard expectations in others. Maybe someday we can do that. Maybe it’s a really bad idea. It’s something to think about in any case. 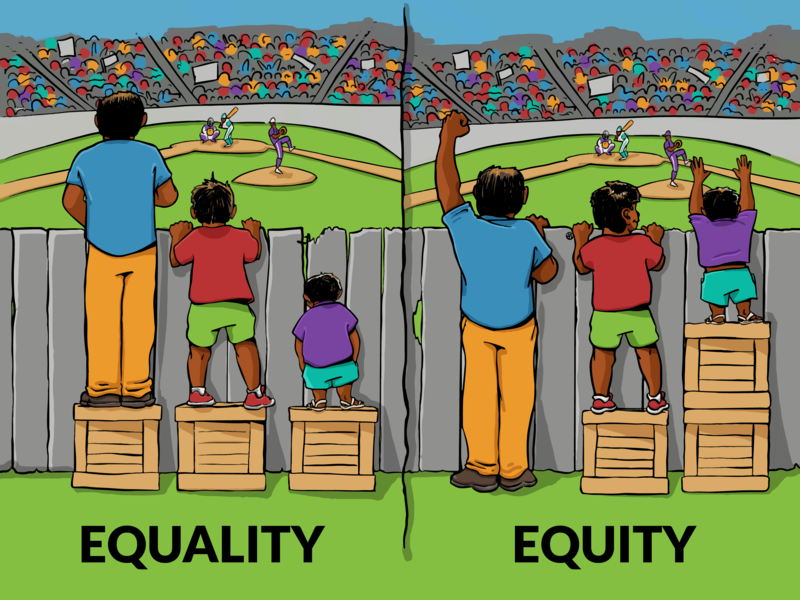 I’ve used the word “equity” here, rather than “equality”. I have in mind this picture from the Interaction Institute for Social Change by Artist Angus Maguire. People are not equal, but they deserve, in my strong opinion, equal – equitable – access to the good things of life. I’m not prepared to say how that should be accomplished. But if it’s true that women, or people of color, tend to be judged unfairly as less desirable workers by the system in place, I believe that something should be done to balance that tendency. I believe that everyone, regardless of birth conditions, home conditions, gender, color, orientation, whatever all … deserves an equitable shot at the work they want, the kind of life they want. I believe that today, that’s not the case. I believe that we need to continue to work until it is. And I believe that job may never be entirely done, but that we can do much better than we do today. Let’s do it.